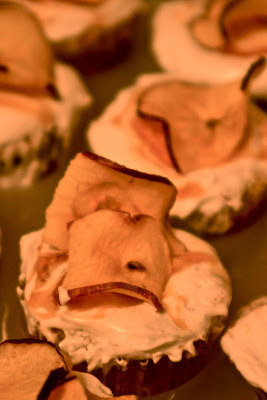 Non-Dairy Apple Cupcakes with "Cream Cheese" & Fluff Frosting / Hey, EEP! Maybe you read the Times article last week which forebode that cupcakes are falling out of favor. Bite your tongues newsies, cupcakes aren't going anywhere. Why would people stop loving tiny little cakes, especially when there are so many things to do with them? Here's my tidbit of advice, if you find yourself bored with cupcakes...challenge yourself. Stop making confetti cupcakes, chocolate frosting, and cool it with the sprinkles. Stop being vanilla! Get in your kitchen, tackle something that seems impossible and make it impossibly delicious. Let's take a quick peek at one element that really allows you to make cupcakes dairy free: Oil. 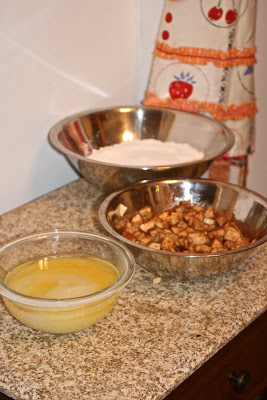 Unless you're making a banana cake or a spice cake (which could hold up with just some applesauce or mashed bananas), oil or margarine are essential to get the texture you'd expect from a cupcakes. This recipe uses regular vegetable oil, mixed with sugar and orange juice. Earth balance is lovely as well, but oil gives your cake a more delicate-plush feeling. Similarly, oil-based butter substitutes are a dream when making non-dairy frosting. Try out Vegan Buttery Sticks from Earth Balance. They look and feel like butter, but they're a little salty so you may need to add a tad more sugar to your topping. As a wink and a nod to the holiday, I mixed spiced apples into the batter, then topped the cupcakes with Ikarian honey and an apple chip. Mmm the flavors of a sweet new year! 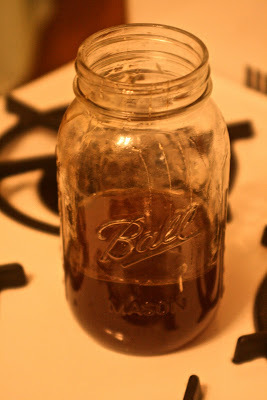 My entire apartment smelt like a cider house...apple pie must be baked a.s.a.p! This recipe was adapted from Mom's Apple Cake from Smitten Kitchen. 1. Preheat oven to 350 degrees. Line a cupcake tin with paper liners. Toss apples, cinnamon and sugar together in a bowl; set aside. 2. Mix flour, baking powder and salt in a large mixing bowl. In a separate bowl, whisk together oil, orange juice, sugar and vanilla. Gradually stir the wet ingredients into the dry ones. Add eggs, one at a time, mixing thoroughly between each addition. Fold about 1/3 apple mixture into the batter. 3. Divide batter into the prepared pan. Spread remaining apples on top of each cup. Bake for 20 to 25 minutes,until cupcakes spring back when lightly touched. 4. Prepare the Frosting: Beat the earth balance with an electric mixer until smooth. Add the toffuti and beat until combined. Beat in marshmallow fluff, vanilla and cinnamon. Slowly beat in confectioners' sugar until frosting reaches the sweetness you desire. Drizzle frosted cupcakes with honey, top with an apple chip and enjoy! You are an amazing food writer! All I can think is I hope I can bake with you in the future (and that vegan's never tasted so good). I WANT TO TRY THE FROSTING! I miss you. You have officially been dubbed an honorary Jew. Mazal Tov!